Twelve-year old Sugar piled on the pounds by not getting enough exercise but she has now been selected for the PDSA’s famous Pet Fit Club to help her fight the flab. 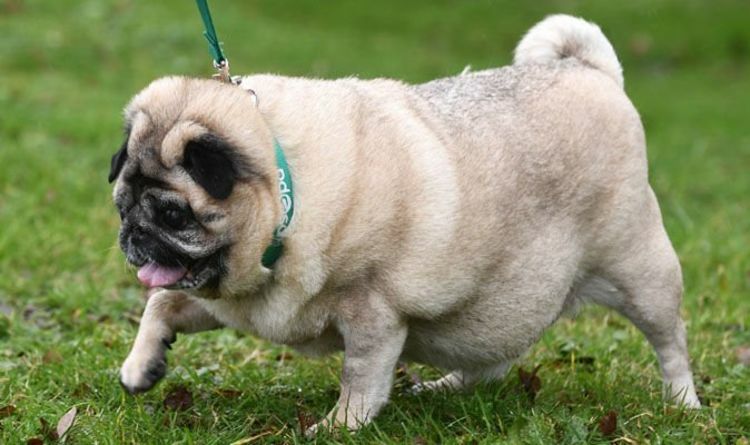 This year marks the 14th anniversary of the national competition that has helped 137 flabby animals lose the equivalent in weight of 1,190 cans of dog food. Not that it is only man’s best friend who can join the club – cats, rabbits and rats are allowed to enter the fat-busting competition. The PDSA today released remarkable photographs of heavily overweight Sugar as she becomes the first entrant into this year’s Pet Fit Club. Although sweet by nature, Sugar weighs double her ideal size, tipping the scales at 26lb (11.9kg) – the same as a two year old child. She was rescued eight months ago by Steve Jones, from Caerphilly, South Wales, who explains how she became overweight and has a series of health issues. Mr Jones, 62, explained: “Sugar’s owner was partially sighted and her limited vision meant she couldn’t cope with her. She never used to go out for walks at all. Since her adoption, Sugar has already lost a couple of pounds with help from veterinary staff at Cardiff PDSA Pet Hospital, and she will continue to be supported on her diet and exercise challenge. Besides selecting up to 15 pets to lose weight over coming months, the PDSA’s Pet Fit Club also highlights the UK’s continuing animal health crisis, with 46 per cent of dogs, 34 per cent of cats and 30 per cent of rabbits overweight or obese. Over feeding and not providing sufficient exercise is the root cause. PDSA vet Olivia Anderson-Nathan said: “Obesity has been a huge problem among UK pets for a number of years and, sadly, there is no sign of improvement. It is one of the biggest long-term health concerns for our pet population, because it is so commonly seen by vets and nurses. “Animals who are overweight have a much greater risk of developing health problems such as arthritis and diabetes, which can have drastic consequences. Previous entrants into the PDSA Fit Club illustrate how commitment to a weight loss regime can have remarkable benefits. Last year the competition had joint winners with Sadie the Labrador, from Basildon, and Borris the spaniel, from Kent, losing a total of 40lb between them, equivalent to a quarter of their bodyweight. Other remarkable weight shifters over the years have included Alfie, the dog who lost 39 percent of his weight after piling on the pounds because he loved roast dinners, and a crisp-eating cat called Zorro who trimmed down by 20 percent. Dr Anderson-Nathan added: “It’s well known that we are a nation of animal lovers, but unfortunately a lot of pet owners are showing this love and affection using food. Yet this way of ‘treating’ your best friend can be bad for their health in the long run. “Pets don’t need human food, in fact a lot of it can be very bad for them. They should be fed a complete pet food suitable for their age and weight, with occasional healthy treats. Our pets also need regular, varied exercise, suitable for their health and to keep their minds stimulated. This year’s PDSA Pet Fit Club champion will be crowned at the end of the year, winning 12 months’ diet free food and a pet-friendly holiday. Owners can find out more and apply online at www.pdsa.org.uk/petfitclub or by calling the Pet Fit Club team on 01952 797246. The closing date is Sunday, March 3. 2019.